Yarn: The grey is Garnstudio Karisma Superwash, the blue is Nature Spun Sport by Brown Sheep Co. 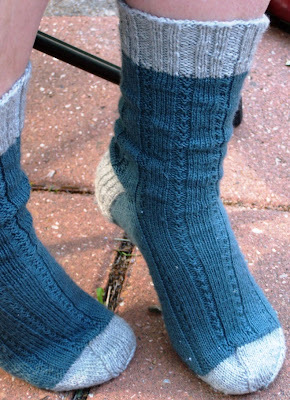 Modifications: I knit both the heel flap and the heel in the contrasting color, as opposed to just the heel. 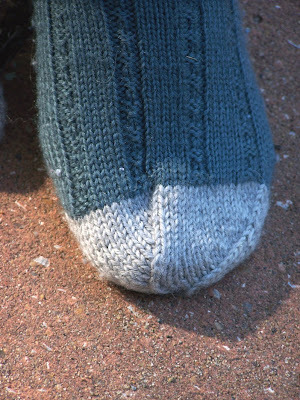 Notes: These are nice, thick, coushy socks. And I was actually able to wearing them - the day after I finished sewing the ends in, the night-time temperatures dropped into the 40's. Talk about good timing! A good thing: The ribbed pattern on the instep and cuff, I love it. A bad thing: The Karisma yarn is already starting to pill, though I was warned of this. Yarn - something with mohair and acrylic I bought from elann.com many years ago. 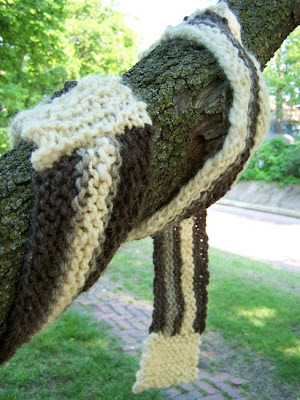 Notes - I don't know what I am going to do with this scarf. 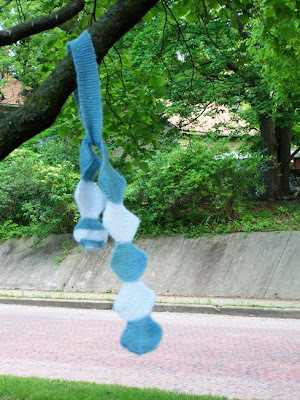 I had to finish knitting the last snowball and weave in all the ends. A good thing - I like the blue and white colors together. I also love how lightweight this scarf is. A bad thing - I ran out of yarn. Yarn: My handspun, all from samples I received while at S.O.A.R. 2006. 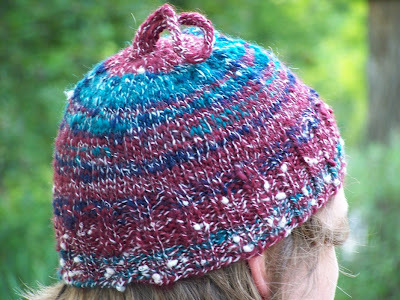 Notes: At the bottom of the hat you may be able to see little nubs that are spun into the yarn. This was a trick I learned at S.O.A.R - I can't remember what they are called. But they are basically made during the plying, but wrapping one ply around the other for a few turns of the wheel. A good thing: How the colors ended up working well together. A bad thing: I can't think of any - I love everything about this hat. I just need to decide if it will be sent to Mongolia, it is a fairly thin hat. Pattern - My own, inspired by Kathryn Alexander, but without the colors. Yarn - Handspun, most created in my SOAR 2006 class. Made from several various breeds of sheep. 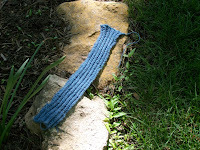 Notes - I first knit the long stripy-sections in garter stitch. At one end of each long section, I picked up stitches to create the white squares. Then I sewed the sections together. 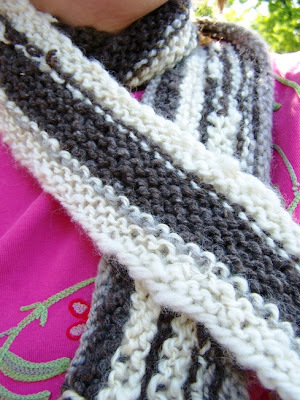 A good thing - a thick warm scarf that I feel does a good job of utilizing the small bits of handspun yarns. A bad thing - My joins between the sections could be neater, both the picking up of the stitches and the sewing. Some of this uneveness is due to the lumpiness of the yarn. No new picture - but I decided to finish this off as a head band rather than a hat. I will be keeping the headband for my self. So - Five items done means a new project can be started. And I have started a new project, but it is a secret project. Shhhh!!! Now to work through some more of those old projects!